Many praise Georgia as being a good pupil in the Eastern Partnership class, but cementing contacts between Georgia and EU citizens is much more than signing political agreements, writes Mikheil Batiashvili. Mikheil Batiashvili is Georgia’s Minister of Education, Science, Culture and Sport. Georgia, an ancient land of writers, poets, artists and composers, is the top guest at the Frankfurt Book Fair which opens on Wednesday (10 October). As the world’s largest book fair, this is a great honour for my country which has hugely benefited from a boom in cultural tourism in the past few years. Under the motto ‘Georgia – Made by Characters’, the Georgian presentation in Frankfurt will focus on the 33 characters of the unique Georgian alphabet and the stories and authors that harness the special expressiveness of the language. By topping the bill at Frankfurt, we expect that there will be a further upsurge in visitors to Georgia with its rich and varied cultural history. I am convinced that culture, arts and education is the only way to forge deep, long-lasting connections and this in turn will make Georgia’s case for becoming part of the European family of nations even stronger. This autumn, Georgia welcomed thousands of visitors for a rich variety of cultural events (Batumi Music Fest, Telavi Classical Music Festival and many more). Also in Brussels, was the Georgian poet Maia Sarishvili, who took part in the renowned Transpoesie poetry festival. These cultural events have helped to boost tourism to Georgia as well as the development of wine-tourism, eco-tourism, adventure-tourism plus winter sports. In the first eight months of this year over three million tourists visited Georgia, an increase of 19% over 2017. Georgia is a small country, about the size of Ireland, but it has an amazing topography with mountains as high as the Alps and beaches to rival the Cote d’Azur. Add interesting cuisine, the world’s oldest wine-making industry and the fascinating cultural and architectural baggage created by a history of invasions, and you have a destination for a huge range of appetites. 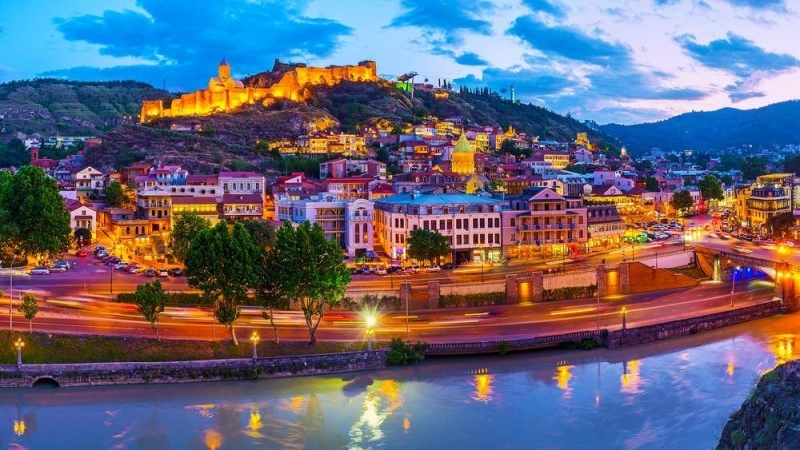 Tbilisi has become a hip capital with an ever-increasing array of galleries, restaurants, bars, clubs and cafes. But many now venture outside the capital to enjoy the delights of Batumi on the coast, the Tusheti mountains, the craggy Mount Ushba, known as the Matterhorn of the Caucasus, and the bulk of Mount Kazbegi, an extinct volcano. Tourism now contributes almost a third of our GDP and provides nearly half a million jobs. Thanks to the visa liberalisation process, there has been a sharp increase in tourists from the EU and we expect to see this trend continuing. Georgia is now a partner in the Creative Europe Programme that allows cultural and creative organisations from Georgia to team up with partners from all over Europe to get funding for cultural cooperation projects, literary translation schemes, and cultural networks and platforms. Education is a key part of culture and essential for modern economic growth. It has been my privilege to preside over an unprecedented period of reforms in our education system with the aim of equipping all our citizens for 21st century jobs. These comprehensive reforms cover pre-school education, high schools, vocational and higher education. The EU has also been of great help in supporting our education reform especially in vocational training and through Erasmus Plus. In the past few years more than 1500 Georgian students were funded in order to continue their short-term mobility studies in leading European universities. The EU4Youth Programme has also been a big success in Georgia. Last month, Commissioner Hahn opened the first Eastern Partnership European School in Georgia with students from Armenia, Azerbaijan, Belarus, Georgia, the Republic of Moldova and Ukraine, stating that it was a new milestone in the EU’s cooperation with its Eastern partners. Inspired by the European school system, students will attend classes in different languages to deepen their knowledge about Europe and the EU. Georgia has also reached out to other Eastern Partnership countries to develop closer partnerships in research and innovation. We are also using the tools provided under the TAIEX twinning programme. Many praise Georgia as being a good pupil in the Eastern Partnership class and one that gets consistent high marks for implementing the association agreement with the EU. But cementing contacts between Georgia and EU citizens is much more than signing political agreements or striking trade and business deals. This article was initially published on www.euractiv.com.